Charming, very ‘French’, historic and traditional. Four words I’d use to describe my impression of Saint Malo from spending 12 hours there one sunny spring day in May. We’d sailed over with Brittany Ferries, which I’ll write about in another post, and arrived in the pretty bay around 8.30am. After a peaceful night’s sleep, we were full of energy ready to explore and scratch the surface of this pretty pirate-famed town. France is so close to the UK, especially if you live in the South of England, and as I’ve only visited Paris, Euro Disney and had a college trip to the Ardèche when I was 17, if there’s one thing this quick-stop trip reminded me, is that I really need to explore more of France. I’ve never really fancied going on a cruise before, but after spending a day on one earlier this year with Foodies100 and having this experience as a little taster, it’s definitely given me some inspiration and something to consider in the future. Aside from the fact we’re usually quite independent travellers and don’t like to have plans made for us, I do like to idea of being able to visit and experience lots of different things over a short period of time. Plus, much to my surprise, the food on board the Bretagne was blooming fantastic! I was invited by Brittany Ferries to experience their ‘Gourmet Cruise‘ break which included two nights on board, a three course dinner in their renowned restaurant with cheese board and coffee, plus a continental breakfast AND lunch at a traditional French restaurant during the day too. Food was clearly going to be the focus of this trip and we were very excited to try and enjoy as much as possible. It’s also worth mentioning that I took my boyfriend, Mum and brother on this trip, which was such a treat. Two of us being vegetarians and two being total carnivores meant we’d get to experience eating all this delicious food with varied opinions on what we enjoyed the most. St. Malo itself is a fortified port city surrounded by 12th-century ramparts, seven metres thick in places. Built to keep out the English in the 17th and 18th centuries, today the citadel protects visitors from brutal Atlantic storms lashing the Brittany coastline. As the ship arrived at the natural harbour, it passed a string of fortified rocky islets that line the channel and leaving the boat, parking our car close to the city entrance, wandering to one of the main squares all happened very quickly and easy. My concerns about parking were unnecessary as there were lots of spaces available and it costs €10 for the whole day. We started with coffees to give us a quick bit of energy and as we’d arrived early it was quite cool to sit and watch the locals getting ready for the day ahead. Tables were being set, signs propped up on the cobbles, fresh flowers placed in vases, and the smell of fresh bread was coming from the bakery on the corner. I’m a big fan of an early start and enjoy the calmness of this time of day. With a table for lunch booked at 12:30 it meant we had just under four hours to see as much as we could and earn some walking points for extra food. The first and most obvious thing to do is climb up one of the many short flight of steps and walk the ramparts. You get a good overview of the town, the layout and can quickly gather your bearings and plan the day ahead. Fuelled up and ready to go we headed up the walls and ventured east. Pointing out things we could see and waiting for the morning fog to disappear eagerly hoping the sun would make an appearance, you can’t help but admire the glistening blue sea and wish you were one of the lucky ones who get to admire this view every day from one of the many balconies that line the town. I totally understand now why this part of France is known as the Emerald Coast. From this height there are panoramic views of the town’s intricate narrow streets and tall, elegant mansions; lined with pretty flower boxes, wooden shutters you can occasionally get a sneak peek into what French lives in this traditional town could be like. The stunning Gothic Cathedral de St Malo dominates the sky-line and from every part of the town you can see its tall spire. There are views inland over the busy commercial harbour and across the estuary of the River Rance and far out to sea, where the islands of Jersey and Guernsey lie. Keep walking and you’ll spot a couple of grassy little parks, a brave poser of a seagull or statues of famous St. Malo historical figures. If you think Saint Malo is pretty on the outside, it’s just as pretty on the inside too. Everyone walks. Or bikes, cars are minimal, and I guess that’s because the winding streets would become a bit of a nightmare. We did jump on the little train which chugged around for 30 minutes and gave a little talk about the history and shared some pirate stories and tales. For a reasonable €6.50 it’s worth it just for the charm… and a little break from the walking. We hopped off at the other end and walked through the cobbled streets of St. Malo’s old town feeling a little like we’d stepped back in time. Oysters, cider and crêpes are local delicacies which can be enjoyed throughout the restaurants and markets of the town. We laughed about how many creperies there were. Down one short street we counted eight! Grabbing a table in the sun we arrived at Lion D’Or ready for our three-course lunch starving and excited to try out some local freshly cooked food. My brother opted for the oysters and the steak, and my Mum also had the steak but for her starter she chose the Pâté. Now, there was a little confusion with our waiter when we first sat down as he told us we could only order from a particular section of the menu, and there were no vegetarian options available. I was clearly a little bit disappointed by this and even more so when I was told I could only have a salad bowl. I mean, come on, aside from the fact that I was starving we were there to review the restaurant and this didn’t seem like the best way to do that. Eventually the waiter fixed the situation, and we could order some vegetarian food from the rest of the menu. Thank goodness! I had Camembert for my starter which was topped with Goji beries and spring onions and came with some freshly baked warm bread for dipping. We drank French wine, people-watched and cooed at the cutest French-Bulldog whilst tucking in to our food all very appreciative of the day we’d had so far. My brother said his steak was one of the best he’d had, the oysters were a first for him and he really enjoyed them. Steve loved the veggie burger and it was most definitely one of the healthiest we’d had. It was a big mash-up of roasted vegetables, a potato patty with goat’s cheese sauce, lots of textures and rich flavours and thankfully was super filling too. If you still have room, finish with something sweet. I had the macarons which were delicious, especially the peanut and salted caramel one. Steve went for the thin and crispy gavottes covered in chocolate and caramel au beurre salé with a token meringue on the side. My Mum and brother went for the very boozy Crème Brûlée which I was a tad jealous of, but we all had a taste of each other’s, so it was a win-win situation really. We eventually walked through a little gap in the wall and came across Bon Secours beach. Probably Saint Malo’s most popular beach, with its open-air, seawater swimming pool and its exceptional, panoramic views over the cliffs of Grand Bé and Petit Bé, Dinard and Cap Fréhel. The fine sandy beach, found just below the ramparts, is also the perfect place to enjoy a nice cold French beer at the very convenient and cool beach bar. I realised at this point how much our children would love it here too. They’d spend hours fishing in the rock pools, exploring the alcoves and cooling down in the safe shallow waters. It feels completely safe and totally relaxed. St Malo is the very essence of France and I quickly realised it’s also something of a lost treasure too. For the first time I considered a driving holiday and I don’t think I would have before coming here. 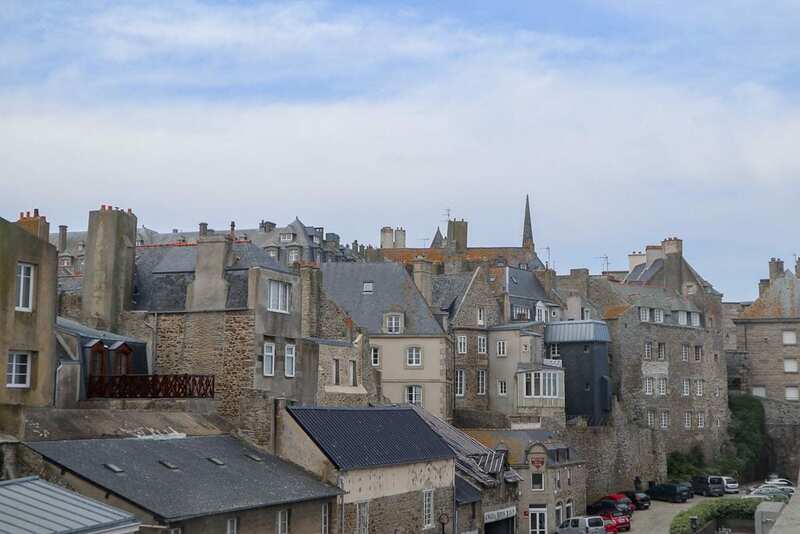 The idea of stopping at cute, traditional towns like St. Malo made me realise that it’s a whole difference experience and something we’d love to do as a family together. Brittany Ferries, we may be back! Especially with on-board sunsets like these.